Preheat oven to 200°C. 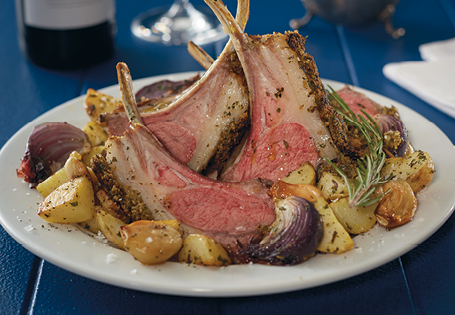 Place lamb in a roasting dish. Mix together breadcrumbs, herbs, garlic and pesto in a bowl, ensuring well combined. Using hands, press the breadcrumb mixture over lamb racks. Roast lamb uncovered for 10 minutes. Reduce oven temperature to 160°C and roast for a further 15-20 minutes for medium rare lamb, or continue cooking until cooked as desired. Take lamb from oven and cover loosely. Rest for at least 5 minutes to ensure juicy meat, then cut the racks into cutlets. Serve lamb with roasted vegetables.